Lily Kambourian was raised in the refugee community of Aleppo, Syria, where her parents had settled after fleeing the Armenian city of Marash. She married Haroutioun Vorperian, a prominent community leader and businessman, in 1937. Over the next six years she had four children. 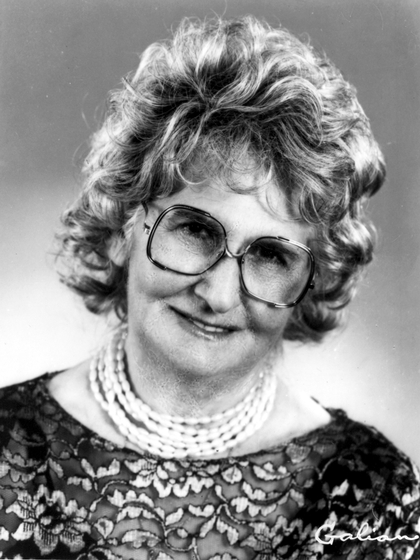 After her husband's death in 1953, she was forced to sell many of her personal possessions to support her children. She moved to Beirut in 1964 and immigrated to the United States in 1978, settling in Southern California, where more than 300,000 Armenians live today. 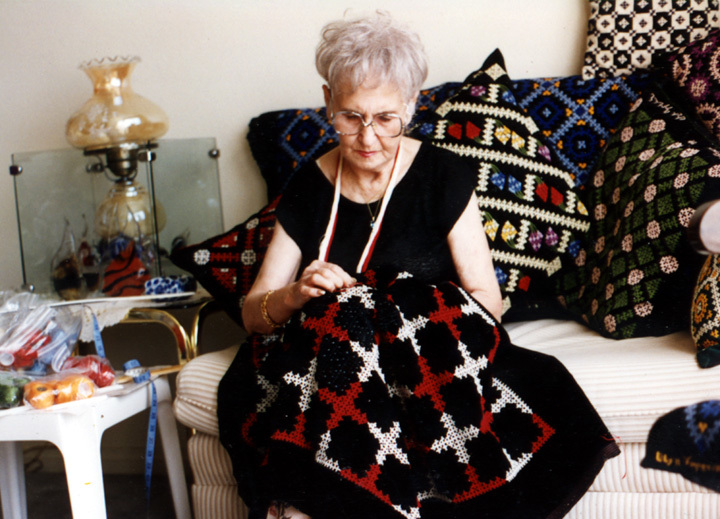 She began embroidering at the age of 12, learning from the elderly Marash women who gathered at her house daily and waited for the refugee aid that her father distributed for the missionary organizations he represented. 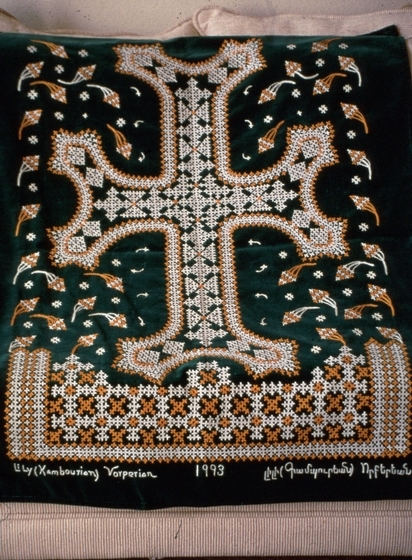 Though she became familiar with eighteen other regional Armenian embroidery styles, Vorperian said that she preferred the Marash embroidery "because it was the hardest." With the exception of her high school years and the time she spent raising her young children alone, she dedicated herself to her embroidery. Marash embroidery is known for its color combinations, intricate designs and complex, demanding stitchery. Vorperian expressed particular pride in the neatness of her work: "Look how clean it is on the back." 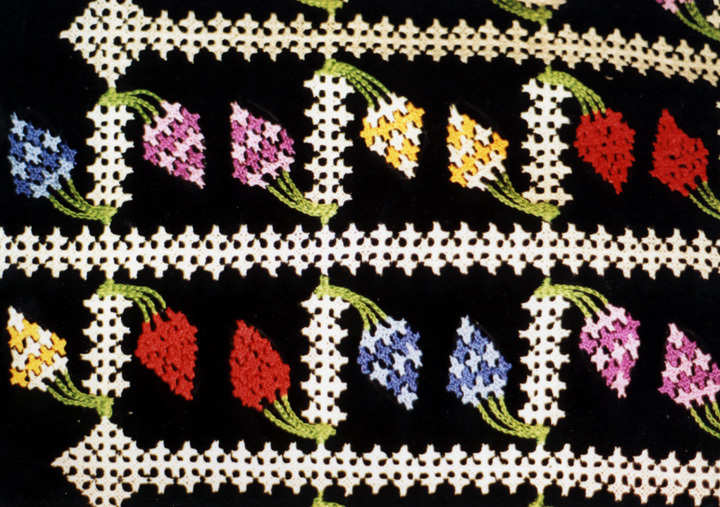 Her Marash technique barely pricks the surface of the reverse side of the fabric; the basis of each design is interconnected herringbone stitches, over and under which the thread may be woven four or even eight times. Clusters of squares or crosses then become the building blocks for bold patterns. The effect is slightly raised and intricate, reminiscent of traditional Armenian wood carving, stonework or jewelry engraving. In Marash embroideries, there are three fundamental stitches. The first and oldest, the hartagar or suntousi gar, resembles a satin stitch. The second, godtgar, is similar to the stem or outline stitch. The patterns of these two stitch types are generally stylized birds, flowers, trees, leaves or fruits and are worked in rich, multicolored silk, highly twisted mercerized cotton or gold thread. 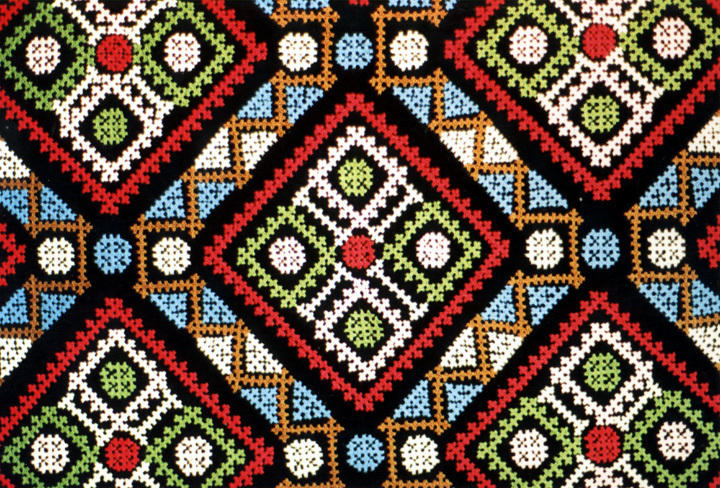 The third stitch, heusvadz gar, is woven or interlaced embroidery worked over two rows of stitches in the form of fishbone or herringbone stitches. The first row of the fishbone stitch has the second row superimposed upon it. The third row is worked by filling in the upper (or lower) outline by a darning-type stitch. 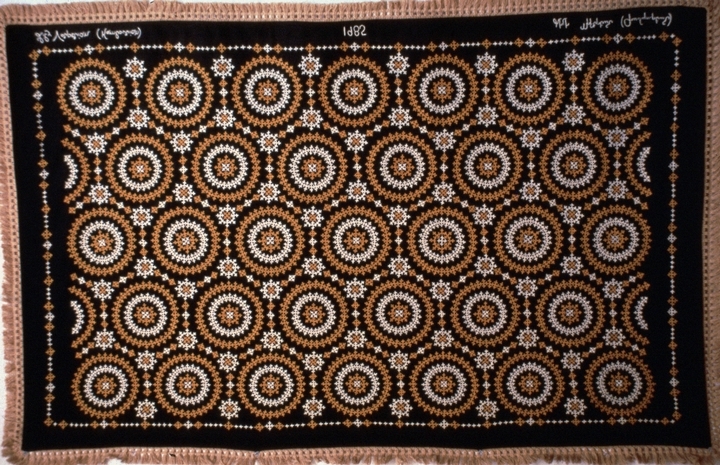 The fourth row completes the process by weaving in and out of each stitch until the work is completed. The patterns of heusvadz gar are geometric, the fundamental design being a group of linear crosses, clusters of crosses, circle and squares. 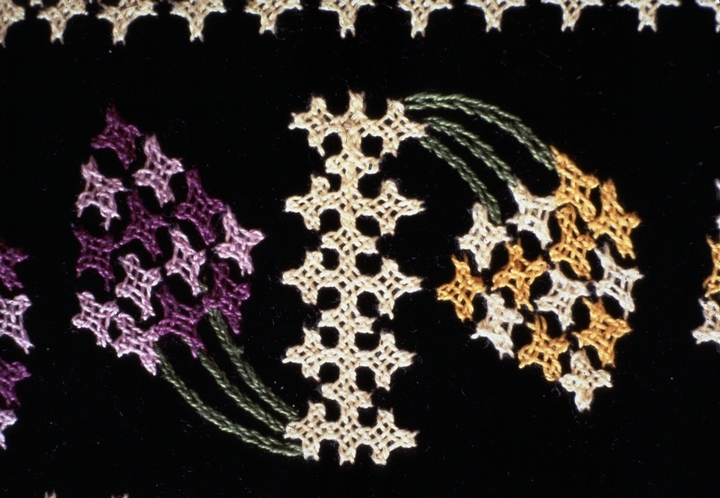 These three stitches are worked on linen, wool, heavy cotton, velvet or silk satin. The designs are printed on the fabric with carved wooden stamps or by painting on the fabric with a brush or steel pen dipped in a special paste. 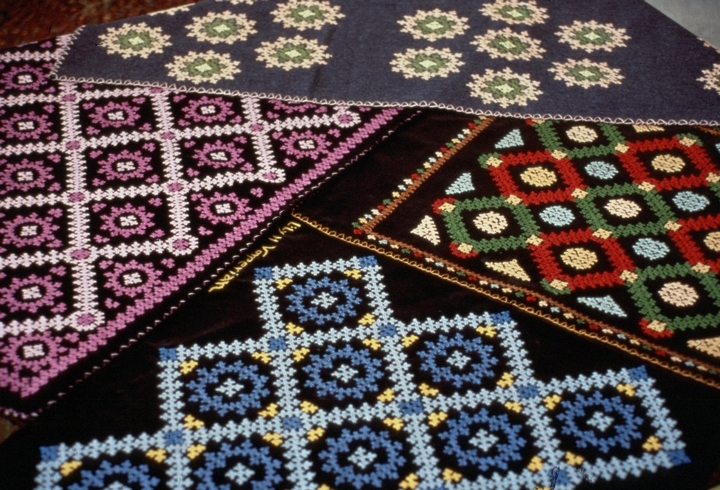 Traditionally, Marash embroidery is done on dark velvet so that the colors stand out. Pieces are finished off with simple X-shaped stitches around the border or with handmade black trim. 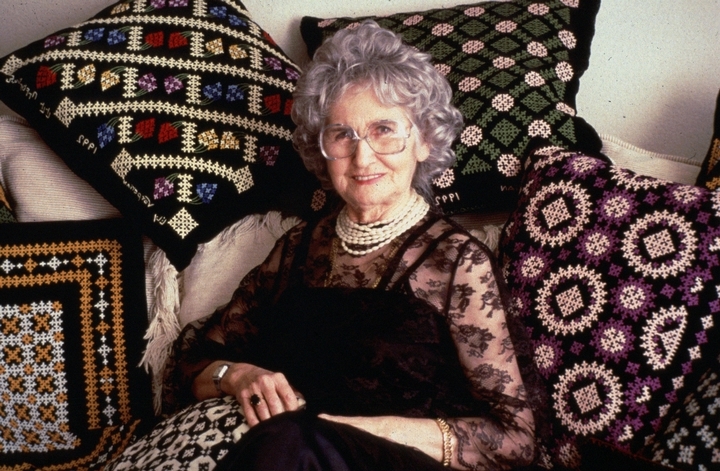 Vorperian decorated her home with Marash embroidery pieces alongside memorabilia from exhibits of her work and family photographs. 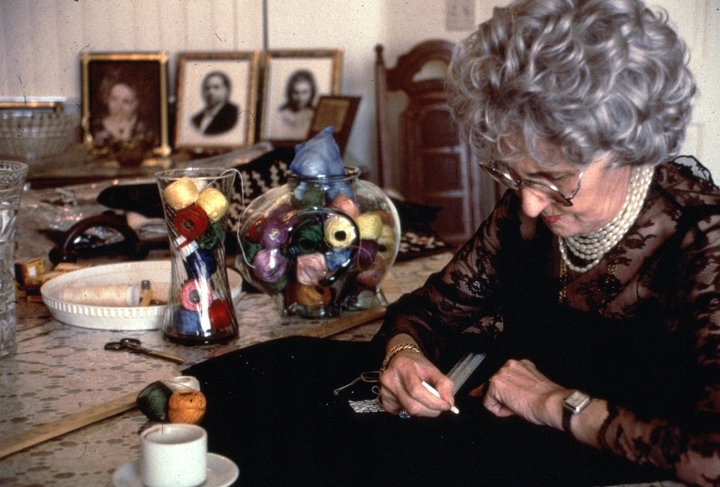 Doing embroidery was part of her daily life. Because each stitch must be drawn onto the fabric before it is stitched, preparing the fabric for a large piece can take several days. Vorperian incorporated traditional designs she recalled from her childhood, when she watched and imitated the older refugee women. 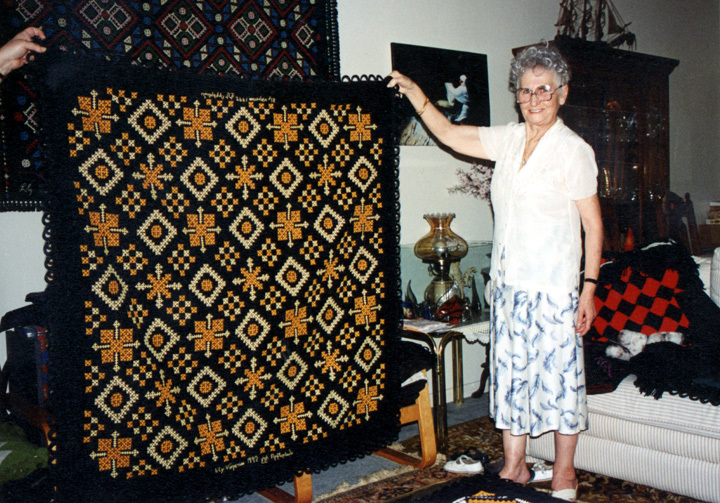 Additionally, she adapted the Marash stitch to create letters and words and made banners for two Armenian American organizations. In these, she incorporated lines from Armenian poetry about the genocide and dislocation of Armenians in 1915. 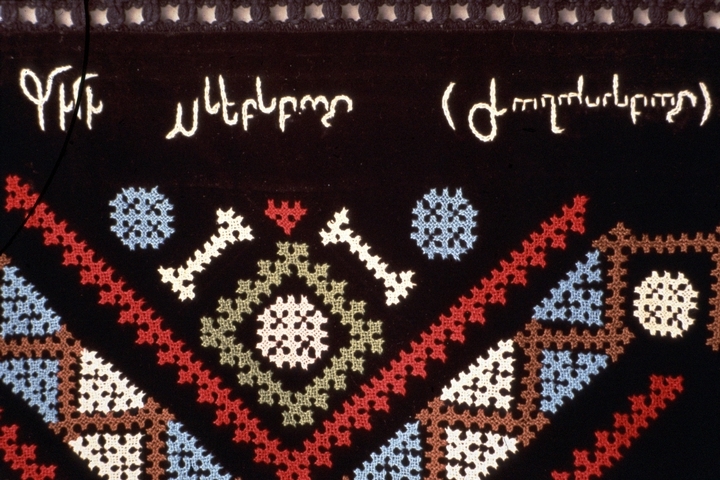 Vorperian signed each piece of her embroidery with a hand-stitched signature in Armenian and English letters. 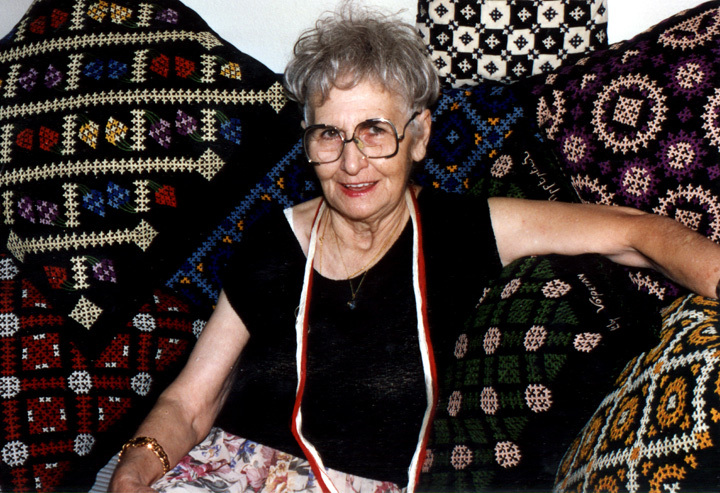 In the 1990s she began to embroider slogans and names in the Armenian alphabet that spoke her sentiment concerning the tragedy and survival of her people, such as "Oh, Armenian people, your only salvation is in your collective strength." Couzian, Diane. "Armenians' Struggle Inspires Artist." Horizon, Armenian Weekly (June 3, 1996) 2, 1: E2. Stanley, T. L. "Woman's Needlework Sews Up Grant." Daily News (Woodland Hills, Calif.) (June 10, 1994): 3.